In 1848 Denmark encountered a war with two southern provinces, strongly supported by Prussia.Denmark won this war. In a military town in the southern part of Denmark, Fredericia, a famous Danish sculptor, Wilhelm Bissen (1798-1868) made a wonderful statue of a Danish Land Soldier to commemorate the event. One would be hard pressed to find a Danish person, who do not recognize this statue. 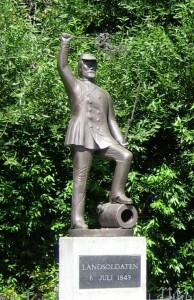 In connection with the centennial in 1948, the artist Peter Bodenholdt of Mill Valley, sculptured a copy of this famous statue in Redwood, and graciously donated it to The Danish Soldiers Club. The statue is now prominently displayed at our facility, flanked by the US and Danish flags.